8:07 a.m.- Officers took a minor accident report in the 700 block of West Perry Street. 9:17 a.m.- A domestic dispute in the 1100 block of Whetstone Street was investigated. 9:25 a.m.- Officers stood by in a civil custody dispute in the 800 block of South Sandusky Avenue. 11:04 a.m.- Officers assisted the Willard Police Department checking for reported missing juveniles in the 1200 block of Teddy Avenue. 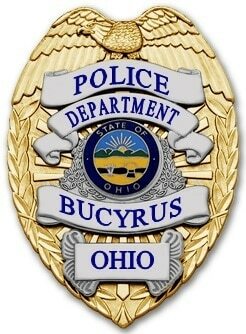 11:45 a.m.- A Bucyrus Plaza resident reported medication stolen from her apartment. 3:20 p.m.- Officers assisted Life Support Team Ambulance in the 900 block of West Mansfield Street. 4:24 p.m.- A theft was reported in the 300 block of Emerson Street and property was recovered and brought to the police station. 4:32 p.m.- Officers assisted Ohio State Patrol on US 30 at Ohio 4 with traffic control stemming from a semi-truck trailer crash that had spilled cargo on the roadway. 5:31 p.m.- A disturbance was reported in the 1000 block of Tiffin Street and one of the parties left the area. 6:01 p.m.- A disturbance was reported in the 200 block of West Charles Street and resolved when one of the parties left. 6:23 p.m.- A suspicious vehicle reported in the 600 block of Prospect Street was a registered business. 7:15 p.m.- Officers attempted to serve a warrant. 7:22 p.m.- A domestic dispute was mediated in the 200 block of Songer Avenue. 7:36 p.m.- Bryan Shick, 27, was arrested on charges of possession of marijuana in the 1700 block of Marion Road after officers were called to the area to investigated a report of a fight. 8:11 p.m.- A two vehicle non-injury collision was investigated on the parking lot of Circle K.
9:09 p.m.- Officers picked up found property in the 800 block of Marion Road. 2:24 a.m.- A report of a suspicious person in the 600 block of North Sandusky Avenue was investigated and Patrick F. Reed, 52, Wisconsin, was arrested for abusing harmful intoxicants and disorderly conduct. He was taken to the Crawford County Justice Center to be held for bond. 5:04 a.m.- A resident in the 1400 block of Cullen Court reported his home and vehicle egged overnight. 5:30 a.m.- A report of a fake $20 bill at Wendy’s was investigated.